Hmmm. I am not so sure about this one. I think much more fun to knit than to wear perhaps. Time will tell. 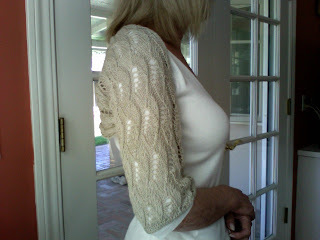 The lace pattern was a fairly easy one. A 20 row repeat that made sense and could easily tell if a mistake was made and correct quickly, so basically no ripping out. The pattern has both written instructions and a chart. 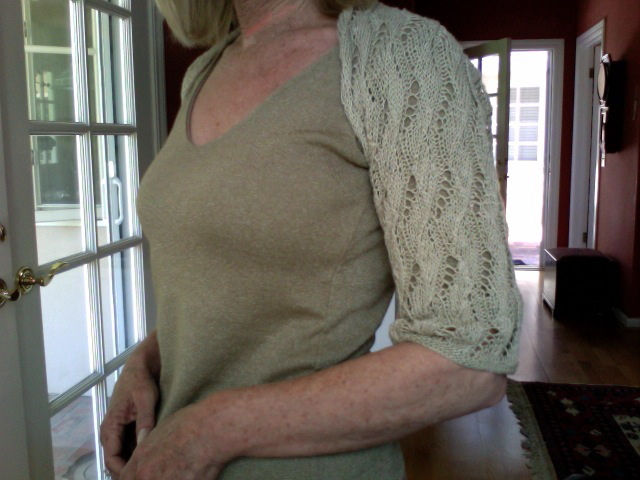 It is basically a long rectangle, knitted from cuff to cuff. I shortened the length of the XS by 4 inches and feel I could have shortened it even more. I used needles sizes 1 and 3, rather than the 2 and 4 the pattern called for. The yarn is the sweetly named Sparrow by Quince and Co. 100% organic linen that is soft enough while knitting, but being linen it didn't have the fun bounce of wool. And here's the back. I don't know what to say about it. I think it makes me look hunched. 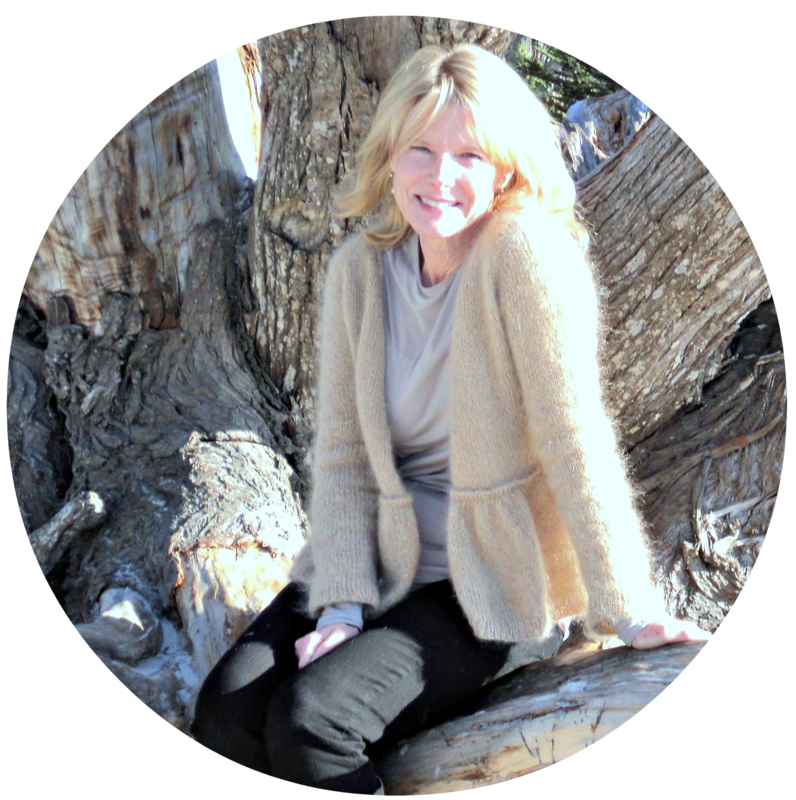 Here it is on my Ravelry page. Oh, dear! That pattern caught my eye when I first saw it, but I don't remember them showing the back. It's such a pleasing stitch pattern, but I'm not sure what you can do about that looseness at the back. 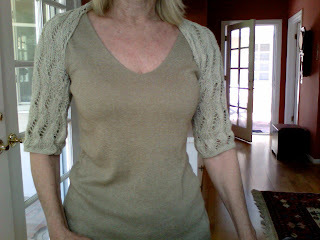 Perhaps pick up stitches at the lower edge and add some ribbing? Not sure how that would look overall, though. If anyone can make it look good, it would be you! Kristen, I agree with you about the sleeves. They could be a bit shorter. As of the back... it looks that there is extra fabric. Is it possible to make the area between two sleeves shorter? Then maybe back will be a bit stretched and will look better? I think the ribbing is an excellent idea! Thank you for the tip, I am going to try that right now. Lidia, I think you are right. I wonder if I should rip out another 5 inches and make the whole thing smaller? I should probably try that before I try ribbing to tighten up the back. My readers have such great ideas. Thank you both so much. I think if perhaps the back were doubled in length and there was some side action to it instead of just sleeves with small back, it would look very elegant. I would agree with your assessment though, not very flattering as it is - though your work is gorgeous, as always. Yes, after I shorten the length from cuff to cuff I will most likely have to add ribbing. I am thinking maybe doing short row ribbing, but I don't know if that is even possible. 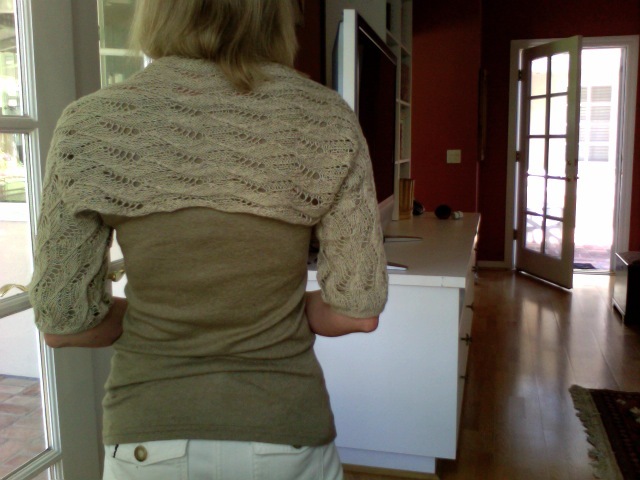 I have only used short rows with garter or stockinette. Looks like I will be learning a lot with this project. oh, that's the worst! When you have a great time knitting something, but don't enjoy the FO. I'd try the ribbing idea, that should help a lot. and if not... maybe frog and use the same lace stitch for something else? It's a lovely pattern, but looks very uncomfortable with that back bunching. Could you maybe just undo the cuff portions (I don't know if you knitted them in the round, in which case it wouldn't make sense, but if you seamed them it might save some effort) and use it as a stole or wrap?